A home's attic must be properly insulated in order to keep the temperature in the home consistent. Attic insulation baffles are important when trying to regulate the temperature in your home. You want to stay warm and toasty during the cold winter months and enjoy the summer months in cool comfort when the heat of summer sets in. Because heat rises, valuable heat can escape if the attic is lacking the right insulation. On the other hand, heat can become trapped in the attic during the summer and reduce the cooling system's efficiency. There are several types of insulation materials to choose from, including styrofoam, reflective, fireproof, ceramic, and fiberglass. 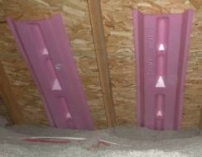 Attic insulation baffles serve to hold the chosen insulator in place and allow for the flow of air through the soffit vents in the roof to the gable. Baffles are especially important in applications where the chosen insulation butts up to the roof sheathing or rafters. Attic insulation baffles are used to prevent the free flow of air from being obstructed. Installing attic insulation baffles is one of the most important steps when insulating an attic and should not be ignored. These baffles are also called rafter vents, and there are many different styles available to choose from. The installation process is fairly simple, but makes a huge difference to the effectiveness of your homes insulation. Attic insulation baffles also protect your home against rot. There are many online tutorials available that will show do-it-yourselfers exactly how to install the attic insulation baffles. You can also get valuable information from a qualified representative at any home improvement store. You will need basic tools, and of course a ladder. It's also helpful to have a second set of hands ready to assist during the installation process.